IP based virtual host configuration is used to host multiple websites on different IP addresses on the same physical server. This is not commonly used while comparing with the name based virtual host. The name based virtual host configuration is the commonly used configuration for serving multiple websites from the same physical server. In this configuration, when apache web server receives a request, it will look for the virtual host file configuration and deliver the content from the configured directory. This process will not show the end user that the same server is responsible for serving of other websites. There is no limit on the number of websites you can host on your server using the virtual host configuration as far as your server can bear the load. In this article, we will be guiding through how to configure apache virtual hosts on Ubuntu 16.04. Throughout this article, we will be referring domain names as “example1.com” and “example2.com”. Replace these example domain names with your actual domain name wherever required. Did you get a chance to read our previous article How to Install Apache, MySQL, PHP (LAMP) Stack on Ubuntu 16.04? This article explains the installation procedure of Apache, MySQL, PHP on Ubuntu. It is the common configuration required to run most of the web applications. This tutorial explains all the steps of virtual host configuration and testing of it for successful configuration. The steps covered in this article are listed below. If you have already installed apache on the server, please move on to the next step. If not, go ahead with the following command to install apache on the server. We need to create a separate directory for each domain name to store the website files. By default, the document root will be /var/www/html. We are going to create separate directories for the domain names example1.com and example2.com in the www directory. that is, the directory structure will look like as below. For a better directory structure and convenience, we will host our website files in the public_html folder which is created inside each domain directory. We will create test pages for both of these example URLs in the directory. This will be used to test our virtual host file after configuration. We will place index pages on both of the domain’s public_html folders. This is a test file for our demo, if you need to use your website files, you can upload it now or later by removing this index file. Now you have successfully created the index files for both the domain names. We will move on to the next step for creating virtual hosts files for both these websites. In this step, we are going to create virtual host files for each of our domain names. This virtual host files will tell the web server to process the correct files for each website request. By default, there will be a virtual hosts file named “000-default.conf” which helps to load the default Apache web server page on request. We have only a few lines to customise in it.All the lines starting with # is a comment. We need to add two more directives after this line to process the domain request. 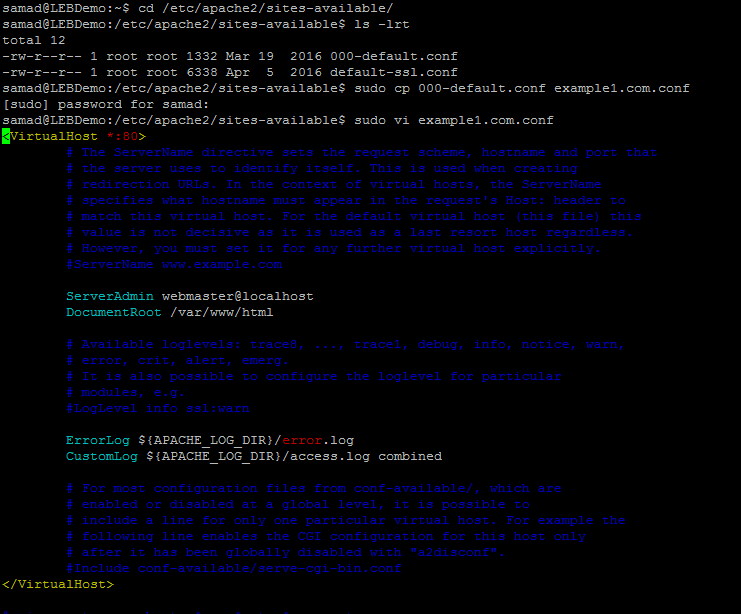 The ServerName and ServerAlias which will match the domain name to process the request. You can save and close the opened virtual host file after making these changes. In this step, we will enable the newly created virtual host files and disable the default file created by apache. 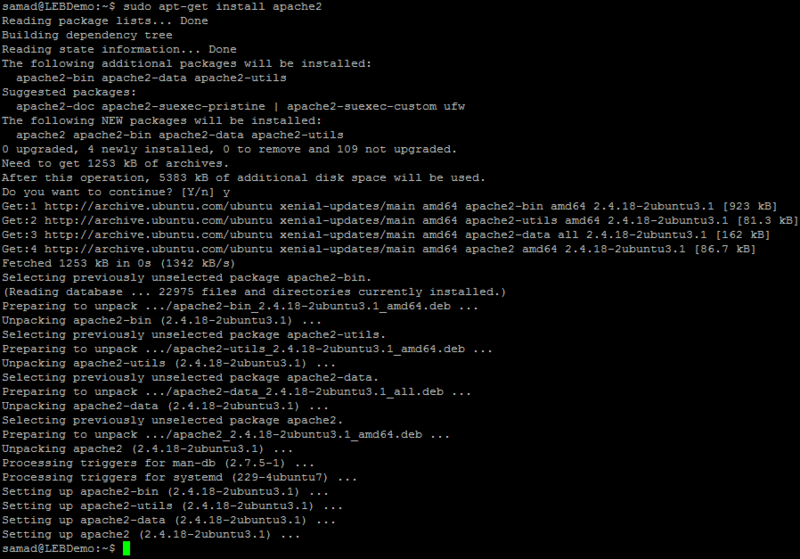 Set up Apache virtual hosts file on Ubuntu has been completed. Now we can go ahead with testing of the virtual host file. Save the hosts file on your local machine and try to access the example domain name from any web browser. If you are receiving the following result, you have successfully configured virtual hosts on Ubuntu. If you have correctly followed our tutorial, you might have ended up configuring two virtual hosts file on ubuntu for running two websites on a single server. You can run multiple websites on the same server by adding more virtual host files to the configuration by repeating the steps mentioned in this article. “AllowOverride All” means use the .htaccess file located in the Directory. Please, this is running if you load the browse of the same local machine where the virtual hosts is, but do not for the others addresses in the same local network. How do it for the others machine in the local network (the mask is the same)? Abdu, thank you very much for this tutorial. It has helped me a lot. Thank you very much it was very helpful. But how can I run Let’s encrypted https for all virtual host. Simple but super duper tutorial, thanks buddy.